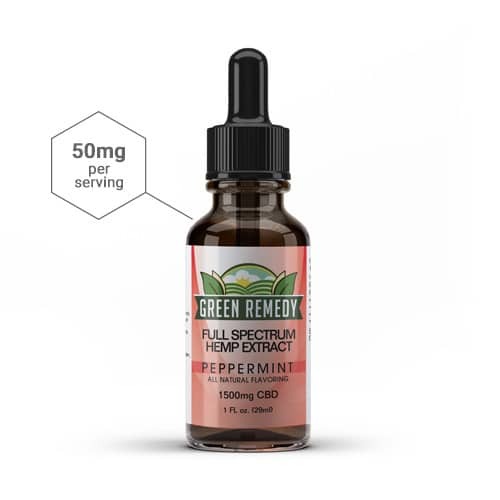 1 fl oz (29ml) bottle contains 1500mg of hemp-derived CBD extract. Each serving will give you 50mg of our full spectrum hemp derived CBD extract. The 1500mg Green Remedy Full Spectrum Hemp CBD Extract is effective, all natural, and delicious. Our peppermint flavoring is created using all natural flavor compounds. All the hemp that Green Remedy extracts is proudly grown in Kentucky. All Green Remedy products are made in Kentucky. 100% American made, nothing imported! Green Remedy hemp derived CBD oil is derived from the best quality hemp grown in Kentucky and is produced in our state of the art facility using our Supercritical Co2 extraction system. Green Remedy produces the highest quality and highest concentration hemp derived CBD oil. Our extraction and manufacturing process ensures maximum concentrations and potency. Green Remedy’s potent Hemp CBD extract maximize naturally occurring essential fatty acids (Omega 3, 6, 9), We use pure, natural, non-GMO industrial Hemp Extract formulated with MCT Coconut Oil. Along with Hemp CBD this product contains a full spectrum of cannabinoids and terpenes. Many believe that a full spectrum allows the cannabinoids their full effect otherwise known as the “Entourage effect”. Green Remedy products are NON-GMO, vegan-friendly, kosher friendly, and gluten-free. Shake bottle well before each use. Take one (1) full dropper under tongue (sublingual) 1-2 times daily or as recommended by your health care professional. Allow the product to rest under tongue for 45-60 seconds before swallowing. The first serving should be taken in the morning on an empty stomach. **Do not use this product if you are pregnant or nursing. It is recommended to consult a medical doctor before using any new product. **Green Remedy products have not been evaluated by the FDA and are not intended to diagnose, treat or cure any disease. Always check with your physician before starting a new product. Green Remedy does not sell or distribute any products that are in violation of the United States Controlled Substances Act (US CSA). Established in 2014, Green Remedy is a leading supplier of top quality hemp derived CBD products. We also wholesale the formulated CBD oil and 99+% CBD isolate that we produce at our facility. Interested in becoming a wholesaler? Contact Us Today.